Early accounts of the traverse and record are contained on the History page. After the Second World War the walk became increasingly popular though , of course, by no means all who started finished. In 1947 Thomas Firbank, back from an adventurous war, wrote a guidebook entitled “ The Welsh Three Thousands” , pre - dating by 50 years that by Roy Clayton and Ronald Turnbull. It was one of a series of Footpath Guides which reflected a growing post war enthusiasm for the great outdoors. Wilfrid Noyce, who was on the 1953 Everest expedition and famous for insisting that a bemused Don Whillans accompany him to the top of the Glyders after a climb on Dinas Cromlech, used to do the Fourteen Threes every year at Easter, starting at Beddgelert and finishing at Conwy. It also began to attract the attention of athletes. A new record of 7 hours 27 minutes was set by Jack Haines and E A Hansom from the Mountain Warfare School in Llanberis. 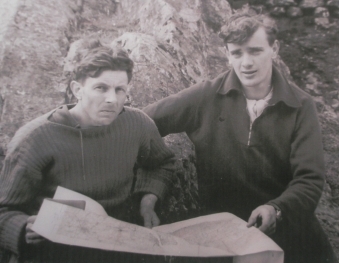 This was reduced by one minute in 1952 by John Disley (pictured right with John Mawe) , the man who introduced the sport of Orienteering to Britain and was Plas y Brenin’s first Chief Instructor. Today, he is President of the Snowdonia Society. His time might well have been less than seven hours had not threatening weather prompted him to set off an hour earlier than planned. As a result he kept arriving at his pre-arranged ‘pit-stops’ too early for his support teams. He continued, without food or drink, until he finally collapsed on top of Pen yr Oleu Wen. Fortunately, his support team on Carnedd Dafydd saw that something was amiss and came haring over to revive him. The following year the record was broken again, this time by four runners who started together, but finished separately. The fastest was Bertie Robertson, who had been English cross-country champion in 1947, in 6 hours dead. One of the others, clocking 6 hours 58 minutes, was Chris Brasher who later was to pace Roger Bannister on the first four-minute mile and went on to win a gold medal in the 3000 metre steeplechase at the Melbourne Olympics in 1956. Brasher was to be a staunch supporter of the Snowdonia Society and a great friend of Esmé Kirby right up to the time of his death in 2003. The next person to break the record, in fact he broke it three times between 1962 and 1965, was Eric Beard, universally known as Beardie. Much-loved as a raconteur and singer of bar-room ballads, Beardie was a member of the Rock and Ice Climbing Club and worked at various times at Glenmore Lodge and Plas y Brenin national mountain centres. Unlike most climbers, he loved travelling fast in the hills and brought the time for the Fourteen Threes down to 5 hours 13 minutes. In 1973, with Chris Brasher and John Cleare, the photographer, in attendance to cover the story for the Observer, Joss Naylor brought the time down to 4 hours 46 minutes. Joss was and is an iconic figure, a sheep farmer from Wasdale in the Lake District. To this day he is the best-known fell-runner in Britain but an approachable, down to earth character for all that. He time was all the more remarkable given that it was a misty day and Joss was on unfamiliar ground without pacers much of the way. On his own admission, he lost a good fifteen minutes when he became “crag-fast” in other words stuck, on Crib Goch, and lost more time in poor visibility on Carnedd Llewelyn. Five years later, on March 18 1978, Paul Lubock completed the traverse in full winter conditions, in a very creditable 8 hours 29 minutes, while in June the same year John Wagstaff chose to make a triple crossing in a total time of 22 hours 49 minutes. For more than twenty years now, the record has stood at 4 hours 19 minutes. This was set in 1988 by a Scot, Colin Donnelly, who had been posted to RAF Valley on Anglesey. Paced by friends from Eryri Harriers, Donnelly included a fifteenth summit, Garnedd Uchaf, between Foel Grach and Foel Fras, which had recently been promoted by the Ordnance Survey. As the maps went metric at the same time it was not widely realized that there was a new three thousander, and as Garnedd Uchaf is an undistinguished top, many prefer to stick with the original fourteen summits. It matters little either way, the extra summit adding five minutes at most to the time. It is a measure of Donnelly’s achievement that his record has not even been seriously attempted, let alone broken, for so long. In 1989 Angela Carson, Donnelly’s wife at the time, set a new women’s record of 5 hours 28 minutes which also still stands today.